Hako's second live album. An almost entirely acoustic set -- just guitar and voice, occasionally a flute or, towards the end, a second guitar. The theatre, Tokyo Hakuhinkan Gekijō (yes, the one on top of the toy store), then as now only seats about 380 people, so the sound is intimate, and the Japanese audience is, as usual, quiet. 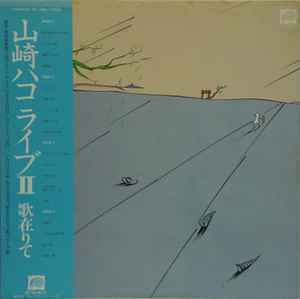 Interestingly, this double LP album includes Hako's arrangements of traditional folk songs from different prefectures (Nagasaki, Miyazaki, Toyama, Hokkaido, Niigata, & Kumamoto). A calm and beautiful album. On the fourth side, she reprises some of her well-known earlier songs.